The Voyager Portable Hoist With Carry Handle. This portable voyager hoist has been designed to be used in conjunction with an overhead gantry and has a convenient carry handle making it easy to transfer so one unit can be used for several rooms. It features a patented ‘Quick Releaser', which means that the hoist can be moved from place to place faster saving valuable time. This system also helps to prevent back injury and strain because virtually no weight is lifted overhead. The unit's controls are easily accessible for both the user and carer. Dual controls - handset and hoist - increase safety and prevent product failure if handset is damaged. Weight 5.5kg. Whether for home care, an emergency or temporary solution, or just that a fixed ceiling lifter is not suitable, the Voyager Portable with its 200kg (31st) lifting capacity provides the perfect answer. Weighing only 5.5 kg (12 lbs.) with the battery and only 4.3 kg (9.5 lbs.) with the battery removed, the Voyager Portable is the lightest portable lift on the market today. The easy-grip handle and rubberised 'feet' make it easy to carry and set down anywhere. It is very important that a ceiling lift be operational all the time - any time. Though our battery can do 30 transfers between charges, there may be occasions where you need more. A spare battery can be available and ready to keep going whenever you need it. Just push a button and the battery pops out, then slide the fresh battery in. In addition, we made sure that our efficient charging system has your battery fully charged within 2-3 hours. Save time, battery power and use proper ergonomics by releasing the strap to lengthen or shorten it quickly. Rather than hold the lift at shoulder height to attach the lift to the rail, the caregiver can lengthen the strap so the lift can be placed on the floor or chair while the lift is attached to the rail. In addition, the lift can be lifted or lowered into position before and after a transfer without using the battery power. This significantly increases the life of the battery while saving time. It is extremely important that the lift be operational at all times. Two sets of controls are right on the lift in addition to the handset that is available. This ensures that if the handset is damaged, the lift can continue to transfer your patients in safety. In the interest of making caregiver tasks more efficient, the fast, efficient motor transfers the patient with a comfortable pace. 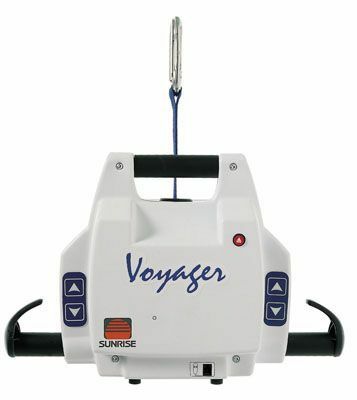 The Voyager Portable has several features for emergency circumstances. The anti-crush sensor, emergency brake, manual emergency lowering option as well as the safety testing below ensure the patient and caregiver is protected and safe.